Customized designs for the harshest environmental conditions. Switches and crossing turnouts and their subsystems (actuation, locking and detection) play an important part in traffic safety, whatever the environmental conditions facing them. In desert areas, sand, high temperatures and extreme exposure to the sun are important considerations to be taken into account for trouble-free operation of this equipment. Thanks to its extensive experience as network supplier for the toughest environments, Vossloh has the capability of suitably addressing the most demanding natural conditions. 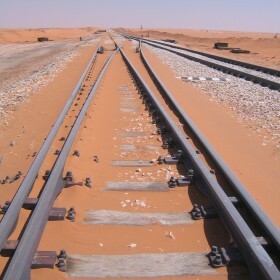 As a way of limiting maintenance difficulties, Vossloh has developed appropriate designs to limit the effects of sand buildup, and components designed to resist the effects of temperature and solar radiation.